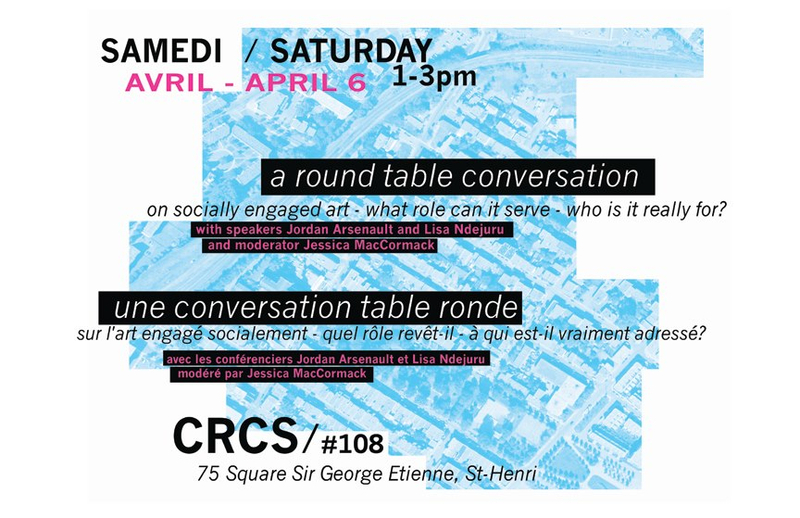 I am excited and honoured to have been invited to speak at this round table event on socially engaged art practice for the Concordia Fine Arts forth year BFA ArtX final project It Matters How You Get Here. I will have the pleasure of sharing this conversation with play-back performance intervention artist Lisa Ndejuru, moderated by my friend and long-time supporter, Jessica MacCormack, and artist Ramona Benveniste. It's free and should be interesting! what role can it serve and who is it really for? @ CRCS St-Zotique, 75 Sir Georges-Étienne-Cartier Square, Montréal. For the last seven months, we have been working as a class both collaboratively and individually, on a group of projects that explore underlying theoretical concerns about the relationships concerning value and exchange, social inequality, and the determination of identity through popular culture. who live and work within the social fabric of this community. à travers la culture populaire. de commerce, en ligne, dans le parc et dans les rues. des meetings, des ateliers et des compilations collaboratives. d'interaction au lieu de simple information. travaillons avec les communauté et les voisinages?